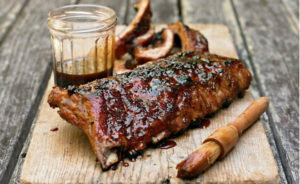 These are the best BBQ baby back ribs you’ll ever eat! I couldn’t be more excited that the unofficial start of the summer season is just a couple of weeks away, with means these ribs are definitely in my future. This Memorial Day weekend, I’ll be firing up the grill and knocking back a few of these babies. I guarantee a happy crowd. Mix the beer, mustard, salt and pepper in a bowl and coat ribs with the mixture. Remove from oven and discard the beer. Cut the racks into portions of 4 ribs. Grill on both sides until golden brown. Serve with your favorite summer salad and enjoy! Those of you who follow me on social media, know how I love Dunkin’ Donuts coffee. Here’s my BBQ sauce inspired by my morning love of coffee. Combine all ingredients in a large, heave saucepan. Simmer ove rlow heart for 20 minutes until it thickens slightly. You can make the sauce ahead. It will keep in the fridge for several days.